Only one day after the amazing Tata Steel tournament finished, another great event starts in Gibraltar, the English piece of rock placed at the entrance of the Mediterranean Sea. This year the line-up is quite interesting, with Veselin Topalv, Hikaru Nakamura, Peter Svidler, Nikita Vitiugov, Dmitry Jakovenko, Pentala Harikrishna, Yangyi Yu, Richard Rapport, Maxim Matlakov, Ivan Cheparinov, Hou Yifan, and many other strong grandmasters, for a total of 70 players. The tournament is a 10 rounds Swiss event, therefore we will see the first rounds with the top guys risking their rating against weaker players, which is always interesting to follow. 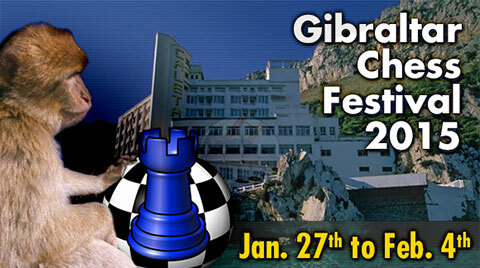 Games start January the 27th at 9:00AM EST - 15:00 CET. Last round, on February the 5th, starts at 5AM EST - 11:00 CET. ICC will show all the top boards. Games start at 9:00AM EST on the 27th? So when and where does your coverage start?